Proposed development at 1001 W. Chicago Ave. Rendering by FitzGerald Associates. 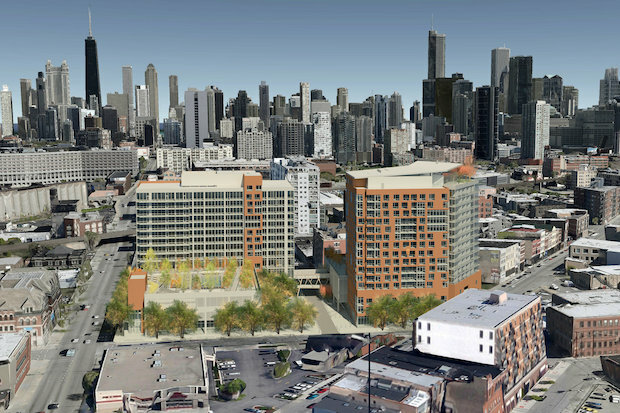 Security Properties from Seattle recently received Plan Commission approval to build 14- and 15-story buildings on the site of the Gonnella bakery at 1001 W. Chicago Avenue, near the busy intersection with Milwaukee and Ogden avenues and the Blue Line’s Chicago stop. 363 apartments and 35,000 square feet of retail would fill the two towers, helping to meet the burgeoning demand to live near transit and downtown and potentially bringing a grocery store to the neighborhood. The alley between the towers would become a shared space plaza, fronted by a bike repair room for residents. Less fortunately, though, the buildings will also include 318 car parking spaces. The city’s transit oriented development (TOD) ordinance allows developers to build 50 percent fewer car parking spaces than normally required for buildings whose main entrances are within 600 feet of a train station. The proposed zoning for this development would require only 182 car parking spaces for the residences and none for the retail space — but instead of a 50 percent reduction, Security has only requested 12 percent fewer spaces than the usual requirement. This many new parking spaces would add even more cars to the six-way junction out front. The long queues of cars here slow buses along the Chicago Transit Authority’s 56-Milwaukee and 66-Chicago bus routes, and also make it difficult for bicyclists to navigate the hazardous intersection. CTA expanded capacity on the 66-Chicago route last year by adding articulated buses, which still have to crawl past cars to get through the Chicago/Ogden/Milwaukee intersection. Strangely, Security will build fewer parking spaces per residence at its similarly-featured new developments in Seattle and Portland, even though those buildings are in decidedly less transit-friendly settings than River West. Closer to home, developer BlitzLake Capital said that fewer than one parking space per two apartments was a good “market” level at a mid-rise apartment building and grocery that they proposed for Lakeview, after the community and alderman had convinced them to cut the amount of parking by two-thirds. Other developers in Chicago have expressed their desire to bypass parking minimums, or to eliminate them altogether. Yes, there should be less parking significantly less this close to the Blue line station that puts you literally minutes from the loop and about 30 min to Ohare. In other news that awful, terrible, POS CVS at chicago / milwaukee needs to be bull-dozed as well and a nice mid-rise tower that meets the intersection be put in its place. There is one thing this town knows how to do and that is waste transit assets that most other US cities can only dream of. The TOD ordinance allows them to reduce parking, but does not require it, correct? That leads me to believe that the developer determined that the extra cost of building parking will be offset by the demand in the neighborhood. Parking demand may vary by neighborhood. It would be reflected in prices. If the price rises high enough, it becomes economically prudent to add parking. What is the average monthly cost of a parking space in that ‘hood? Perhaps the close proximity to the Kennedy expressway influenced the developer to keep the parking spaces higher than necessary–you know, like old-fashioned AOD (Automobile-Oriented Development)? You bring up a good point about access to an expressway. I have two co-workers who, with their partners, live directly off of Congress. One person holds a job downtown and walks to work, to other works in the Western suburbs and has easy access to the Ike. But to make that work, you do need a parking space. On the other hand, I also have colleagues who live downtown Naperville with their partner. One takes the Metra to Union, the other works locally in Naperville. Perhaps, or perhaps the people involved in the development of this parcel were not aware of the byzantine nature of Chicago’s muni ordinance esp regarding TOD etc. Aren’t some of the parking spaces allocated to retail, so the parking to apartment ratio is is close to 2:3? There was some discussion around this earlier this week. The proposed zoning may not require parking for retail, but that kind of space would be a hard sell without parking for customers. There’s no sense in complaining about it. The crazy 6 way at Milwaukee will probably make people NOT buy a parking space. The developer is going to spend money on parking spaces that he won’t recoup from parking fees. This occurred in Evanston, where the towers near the Davis street station have too many parking spaces for their residents, and the traffic is way worse at this new development. The market will correct future mistakes. How exactly will “the” market do that? At best we are left with negative externalities these developments foist on the rest of us. There is no “the” market there are markets and they in no way resemble the econ 101 mathematically simplified idea of “the” market that has suffused American popular culture. And there are other businesses that may find having a place for a valet to park their cars useful. I don’t have exact numbers, but this being near the epicenter of Chicago’s tech hub, I get the distinct feeling that the clearing price for these new apartments is far above the actual cost of providing more parking spaces than necessary. I don’t think we have such a market. What has caused Gonnella bakery to leave the city and to truck bread in from Aurora? Probably because they needed a bigger space, and space is expensive in the city. Especially for a low-margin item like bread. That’s fine… it means people need the space more than bread companies, and everyone’s happy. People also need the space more than cars. Chicago’s TOD ordinance is not byzantine (at least to people who can read). The Aurora plant already existed. It opened in 2003. The word used in articles is consolidating but they do not say why, only that Gonnella put the property up for sale through a firm a couple years ago. If residential developers were making them an offer they could not pass up that would make sense, but that did not occur. The more services and businesses which support city life that are located outside the city, the more urban interstates and arterial roadways become an absolute necessity to get vital goods like fresh food into the city every day. Part of having these dense walkable neighborhoods and such is to have things like bread companies and other companies that make things nearby, not in satellite cities. They are part of a vibrant urban life. I appreciate that we want walkable neighborhoods and that we want to bike to work. We live in a climate that makes driving – especially to a grocery store or with kids- more than a convince. Mayor Daley screwed us all when he sold the parking rights out from under us and now we pay the price of private parking pirates, which Security is wisely providing. They add value to the condos – I wouldn’t buy if they didn’t offer it. That is the market. The other issue here are the trucks from Bigane Asphalt (and Ogden materials) – they are a dangerous lot of drivers, they cause a ton of traffic, beat up the road and spew noise and dust pollution in the neighborhood. Alex, I clicked on your profile and read a bunch of your old posts. You have got to be the most hyperbolically cynical, most life-and-people-hating, most intensely arrogant, and most miserable (in the literal sense) person on earth. My god, just…change. So are you advocating that the city take the property thru eminent domain and auction it off to the highest bidder? If not, how do you plan to do this? For all you know someone could own the land, a second party, the building and CVS rents both on multi year lease. Unless the value of the property skyrockets making it attractive to all parties chances are change will not happen for many years out. Its nice to sit around and blue sky, however, CVS made a determination many years ago that this was a viable location and probably will continue down the line. And since there is other viable properly in the area that has the potential to go to market sooner I don’t see this happening. I would also be concerned that some of the remaining mom and pop businesses in the area will eventually he priced out. When you build up an area with the 1,500 per month one bedrooms and 2,500 per month two bedroom apts albeit on a transportation hub, doesn’t necessarily mean all people will want to use public trans all the time. And while it may take many years to rebuild it into the “walkable” community you so desire, with attractive shops etc, people may have to go outside the area to obtain the things they want in the meantime. No personal attacks please. These will be deleted. Thank you. Why would they be better? Less parking would only be better for other drivers who don’t live in the building. This level of parking is disappointing, but I stand by my position that a builder should be able to build parking at his own expense if he wants to. This is far different from requiring a builder to create a minimum number of parking spaces. The vast majority of Americans do not consider walking or biking as even an option, especially when carrying something home or transporting children (just look at the comments on this thread). Somewhat off topic, but the Chicago Fire Dept should seriously consider reconfiguring or moving the fire department that’s on the other side of that intersection, its nothing but a chaotic mess and oftentimes vehicles and busses block the entrances. Its not a terribly safe intersection for bicyclists either as the road is pretty narrow there for a 4 lane highway (though it would really help if they restriped the now faded lanes). The actual number of parking spots is less important than the way that the garage entrances and exits interact with the sidewalk and street. I’ve seen so many projects that are really badly designed, which force drivers into dense pedestrian areas and onto clogged streets, instead of placing driveways where they can have less impact. If accommodating cars is unavoidable, and to a certain extent that is true, we need to design better for it instead of making everyone more miserable. Wasn’t it an Osco, in the pre-CVS purchase era? Place has been there for quite a while, hasn’t it? The immediate area was a lot different 20 years ago. I nowhere advocated eminent domain. However you do love to claim that I am always advocating eminent domain…..see your tiresome maunder re the Chody development on Broadway. A comment was deleted because it violated our comments policy about attacking other readers. It may be allocated, but it fulfills no zoning code requirement under the district they’re seeking (B3-5). Zoning, FAR, the TOD ordinance the possible designations of P-streets the possible interactions of PMD’s and other factors do indeed make Chicago muni code Byzantine for those who can read. Clearly for those who cannot read; they would not at all be Byzantine. The TOD ordinance isn’t a single paragraph. It’s spread over a few sections of the zoning code. First you read the “transit-served location: parking” section, then the “transit-served location: minimum lot area” section, and then you read the “required off-street parking ratios” section. I don’t think any part of the zoning code, or the Municipal Code of Chicago, as a whole, has any non-complicated parts. Please don’t write in ways that attack other commenters. There are negative aspects the public experiences when allowing the developer to build as much parking as they want (an “oversupply”). I think a parking policy should be thought of as an area policy and not necessarily as a parcel-level policy (based on that parcel’s land use). The TOD parking ordinance is kind of somewhere between an area and parcel-levely policy. “As we know, an oversupply of parking can have deleterious effects on economic development, consumers, and the community. The high cost of parking construction and maintenance drives construction costs up and reduces the supply of affordable housing. Unless parking costs are unbundled, or separated from the cost of housing, households are forced to pay for parking whether they need it or not. Here’s a database that shows the dozens of developments with over $100 million worth of unused parking spaces around San Francisco and San Jose. Certainly, probably was an Osco. CvS bought the stand alone Oscos about 15 years ago. My comment was really to the extent that CVS isn’t going anywhere unless an offer comes in that makes business sense. And I dont see it happening in the near future as the area is just beginning a redevelopment phase. Well you do seem to advocate that someone needs to redevelop property in a manner you so desire. Well if there is no developer willing to step up and do it, how is it supposed to get done? The only other option is to publically take it or wait. And sometimes that wait can be a very long time. Regarding Broadway… advocating turning Broadway into a P street designation when what you really want is to thwart development you dont like and is inconsistent with other nearby property uses is just down right silly. The three adjacent blocks are shopping centers. No developer stepped forward to build mixed residential and retail or TOD. The former funeral home was a dangerous mess. Maybe in 20 years or more the property will be redeveloped again, but in the meantime me and my neighbors should have live with an undeveloped mess because you want a P street or TOD. Times change and needs change overtime. But you cant hold back development today on the basis of what people may want in the future or investors may choose not to invest at all. And you certainly can change the zoning under the CVS, but that doesn’t mean CVS will sell out to a developer anytime soon. I do not recall advocating turning Broadway into a P-street. I do recall that you believed that my claim for modifying the zoning amounted to a taking (again the eminent domain nonsense which you see everywhere). When in fact it would almost certainly not be a regulatory taking under Illinois law. So that claim of your as is your other whimsy is false. Is simply not true. In fact there was a developer who planned a mixed use development there but ended up a casualty of the great depression of 2007. Chody swooped in after and they simply only do autocentric suburban blight. Please do get the facts straight. There was a plan to build a 4-6 story development in the early to mid-oughts. The neighbors to the west made such a ruckus that the then Alderman down-zoned that stretch of Broadway to a single story development with no parking in back. That development died because of the downzoning put in place. Fact is that Chody, or any developer for that matter, is limited to “autocentric suburban blight” due to the current zoning. It just may be that Chody is better at marketing this kind of development than others. Chody swooped in? It was for sale for years. If you can show there were other bidders for the property you can use swooped. Where were the other bidders and their proposals? The property was listed on all the business real estate websites. No one was keeping it a secret. The market changed and banks started lending again. Any developer had all the same tools as Chody. Your “claim” for modifiying the zoning? Unless a property owner so requests a zoning change or a community process happens that results in a zoning change or its part of a city wide zoning remap (which happened in 2005 in Chicago), you as an individual have no say in how someone’s property is zoned or can be zoned. If you want to make such a change, go to the local alderman, put together a neighborhood committee, provide documentation as to why a change is needed. Go out then and get the buy-in of the community at large. That’s how its done. And even then, it may not necessarily result in anything changing. If you want other people to do this work for you, dream on. and as such has max heights of 50 ft.
17-3-0102 B1, Neighborhood Shopping District. 17-3-0102-A The B1, Neighborhood Shopping district is intended to accommodate a broad range of small-scale retail and service uses. 17-3-0102-B B1 zoning is intended to be applied in compact nodes at the intersection of two or more major streets or in a cohesive linear fashion along relatively narrow streets that have low traffic speeds and volumes (compared to multi-lane, major streets). 17-3-0102-C The B1 district is intended to exhibit the physical characteristics of storefront-style shopping streets that are oriented to pedestrians. 17-3-0102-D The B1 district permits residential dwelling units above the ground floor. 17-3-0102-E The B1 district can be combined with the dash 1, dash 1.5, dash 2, dash 3 or dash 5 bulk and density designations (see Sec. 17-3-0401). As such this Chody blight is an utter fail ; and on the plain meaning of the code in violation of the zoning code. “Vacant since 2003 when Piser Weinstein Menorah Chapel moved to Skokie, the building has been in limbo for the past seven years. A venture led by local developer Stuart Miller acquired the property, along with a three-story apartment building at 5200 N. Broadway, for $7.0 million in 2005 with plans to build a five-story retail and condominium project, according to Cook County records. I stand corrected about the zoning. I remembered that the neighbors opposition led to a zoning change, but I was wrong. What have you done to see if this can be changed? Have you talked to the alderman? Did you attend any meeting on the subject? People who think zoning rules and odinances are a hard set of rules that must be adhered to with little consideration of actual every day life will often find themselves unhappy with development outcomes. For you it may seem byzantine, but for others its progress down a bumpy road. Ibwas at many of the downzoning meetings when the west side of Broadway went from B3 to B1. My neighbors had signs on their lawns saying “stop the towers” which made quite the impression on Mary Ann Smith. The Edgewater Historic Society weighed in on the Pizer property when the proposal forvthe property included tearing down the orange rated property on the northwest corner of Foster and Broadway as part of proposal. The market had turned south in the middle of all this, but that project was never going to get off the ground even if the economy had gone bad. Heres what you need to understand. Zoning is one of the most litigated pieces of our legal system. No one goes into development with the understanding that the ordinances arent subject to some negotiation with variances and waivers administrative adjustments and special use permits. And from the city’s point of view it cant be seen as being capricious in its determinations of how to let property owners use their property considering how nearby property is currently used and what the current use of the property is as well as possibly future use. In the case of the Chody property, of course the city wants to get a valuable piece of property back paying property taxes yielding much more than the unused property was. The aldermanwill listen to his or her constituents. The B1 ordinance doesnot specifically bar curb cuts, all you need is a special use permit. The nearby nieghbors indicated they didn’t want rear parking with entry to a commercial property thru a primarily residential used alley. Just because the zoning will allow up to four stories and it would allow for TOD doesn’t mean a developer has to build such. The developer came with a proposal to use the property in a manner of use similar to nearby property and no other proposals were offered by other developers on a property that was a nuisance. While in a perfect world rules are rules but with zoning everything is subject to negotiations because property rights and public rights have to be considered, and are often in conflict. In a perfect world you would hold back development unless the perfect developer stepped up with perfect plan which could take years to get. In the meantime the economy fluctuates with up and down markets. The city knows this, banks and lenders know this, and the neighbors who have to live next to a property that is being defaced by graffiti taggers and stripped by vagrants who break into it regularly. Having the perfect world you want may not always work out. Deal with it. Your incongruous commentary is puzzling for when I suggested that Harry Osterman ought to rezone the Chody development on Broadway you incorrectly harangued me with claims that that would amount to a taking; I dispatched that argument with as much ease as I have dispatched this argument. How in the first instance could you have ever considered it a taking if you here now hold a protean idea of zoning. Which is it? Zoning as a fixed entitlement or zoning as a mere legal irrelevancy? to the subject property (rendering it in nonconformance with existing uses in the area), and it fails to serve any public purpose. It is further argued that the reclassification violated Harris’ vested rights acquired under the original classification. Harris points out that a purchase, a sale and certain charitable donations were undertaken in reliance on the R-8 zoning. in determining validity of an ordinance are the following: (1) The existing uses and zoning of nearby property [citations], (2) the extent to which property values are diminished by the particular zoning restrictions [citations], (3) the extent to which the destruction of property values of plaintiff promotes the health, safety, morals or general welfare of the public [citations], (4) the relative gain to the public as compared to the hardship imposed upon the individual property owner [citations], [and] (5) the suitability of the subject property for the zoned purposes * * *.” La Salle National Bank v. County of Cook (1957), 12 Ill.2d 40, 46-47. We find that these factors weigh substantially in favor of Harris. As previously noted, most of the property within the immediate subject area, fronting Lake Shore Drive, was zoned R-8 and had been so classified since 1961. The ordinance in question affects only the Kellogg property. Although there was conflicting evidence as to whether the rezoning was pursuant to a comprehensive plan, this fact does not, as Oakdale suggests, “require a finding that the reasonableness of the ordinance is debatable.” (12 Ill.2d 40, 47.) In addition, the trial court found that the harm to Harris outweighed any benefit to the public. The down-zoning precluded the negotiated land sale, substantially reduced the value of the property, and impedes Harris’ fiduciary responsibilities as to its charitable obligations. In terms of the suitability of the property for R-5 zoning, many of the witnesses testified that the highest and best use of the property was development in accordance with R-8 zoning. There was testimony to the effect that construction consistent with an R-8 classification would have no adverse effect upon the community, or the value of the surrounding properties. Cook (1979), 75 Ill.2d 301, quoting Tomasek v. City of Des Plaines (1976), 64 Ill.2d 172, 179-80.) This is because “a property owner has the right to expect that the classification imposed by the original zoning ordinance will not be changed unless such is required for the public good.” (Garner v. City of Carmi (1963), 28 Ill.2d 560, 564; Zilien v. City of Chicago (1953), 415 Ill. 488, 493.) The trial court found an undue invasion of Harris’ constitutional rights without a sufficient concomitant benefit to the public. From our review of the record, we are unable to say that this determination was against the manifest weight of the evidence. SeeLa Grange State Bank v. County of Cook (1979), 75 Ill.2d 301, 309; Pioneer Trust & Savings Bank v. County of Cook (1978), 71 Ill.2d 510, 516-17.
ubstantial case law exists I suggest reading Harris Trust vs Duggan. Substantial case law exists. I particularly like Harris Trust vs Duggan. Ive copied relant parts below. Cited in this case is Tomasek v City of Des Plaines. The right of a property owner to expect the classification of zoning will not be changed…uless it is reqired for the public good. And certainly the arguement can be made that rezoning Broadway to a P district would be for the public good, however, is the city likely to tie themselves up in years of litigation and millions of dollars in legal fees litigating over a P street designations over a street thats current use is clearly not a P street. No the city is going to choose future property taxes and sales taxes to be collected and news jobs to be created. And lastly, for the Alderman he would have to do the rezoning it based on a comprehensive plan for it to have any legal standing. I never argued that existing zoning is not valid, presumed or otherwise. You keep changing the argument. This was not the issue we started with in either matter. The case law you cite is not on point re the Chody site months ago when it was announced they were planning a strip mall. Unlike the case you cite no one would be attacking the code to establish an in place ordinance’s invalidity in that instance. Unless you are an attorney do not try to play one on the internet. But bottom line back then you made the takings / eminent domain issue which you are wont to do; I simply claimed that such a change would not be a taking and would not implicate eminent domain. At that point another attorney came on board and while he disagreed with my end., ie stopping a strip mall, agreed with my analysis. That being said I am done discussing this with you because you continue to change the issue, move the goal posts, and misapply case law you believe you understand. I am glad we can put this discussion to bed. It’s a done deal after all. Construction has started.